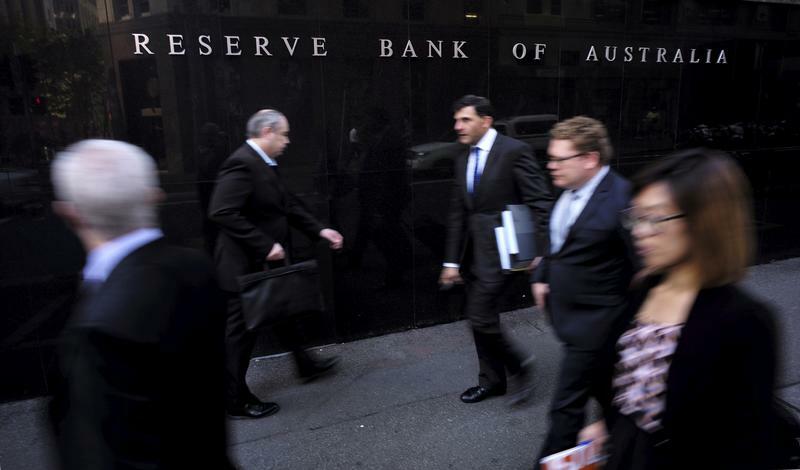 FILE PHOTO - Business people walk outside the Reserve Bank of Australia (RBA) in Sydney May 5, 2015. Australia’s economy grew 0.2 percent in the fourth quarter from the third quarter, according to official figures released on March 6. Analysts polled by Reuters had expected the economy to expand by 0.3 percent in the three months ending Dec. 31, after a 0.3 percent rise in the third quarter. Annual growth was 2.3 percent, the slowest since mid-2017. The Reserve Bank of Australia on March 5 left benchmark interest rates at 1.5 percent, and signaled a steady policy outlook. The central bank has played down the damage done by falling property values, noting they come after a decade of booming prices. Home prices nationally fell 0.7 percent in February from January, when they dropped 1 percent, property consultant CoreLogic said on March 1. Values were down 6.3 percent from a year earlier. The index has fallen in 14 of the past 16 months. Australia is due to hold a general election in May, and the incumbent Liberal-National government of Prime Minister Scott Morrison is trailing in the polls. The centre-right government is widely expected to bring out voter-friendly spending plans and tax cuts in its annual budget on April 2.